★★★★★ Ironwear Fitness products are by far the best wearable weight systems available. I am 28 years old and two years ago I purchased the “Hulk Max 24 Club” system and it has since transformed my fitness level and workout routine. I am not a professional trainer, coach, or athlete- just an average guy that enjoys exercise and being in shape. After a thorough review, I chose the “Hulk Max 24 Club” system by Ironwear Fitness. There were cheaper wrist and ankle weights available but I could tell that they were far inferior. Ironwear Fitness products by comparison were far more professional. I could tell the company knew exactly what I was looking for just by browsing the Ironwear Fitness website. They basically were advertising exactly what I had pictured in my mind. They had specifically designed their weight systems to counter the problems of other wearable weights. The outer material is constructed of highly durable weather-resistant material. The inner weights are heavy and flexible but solid so they are less bulky and cannot break like other products. The shape of the shells are ergonomic and use large Velcro straps so they will not shift during exercise and yet are easy to put on and take off. 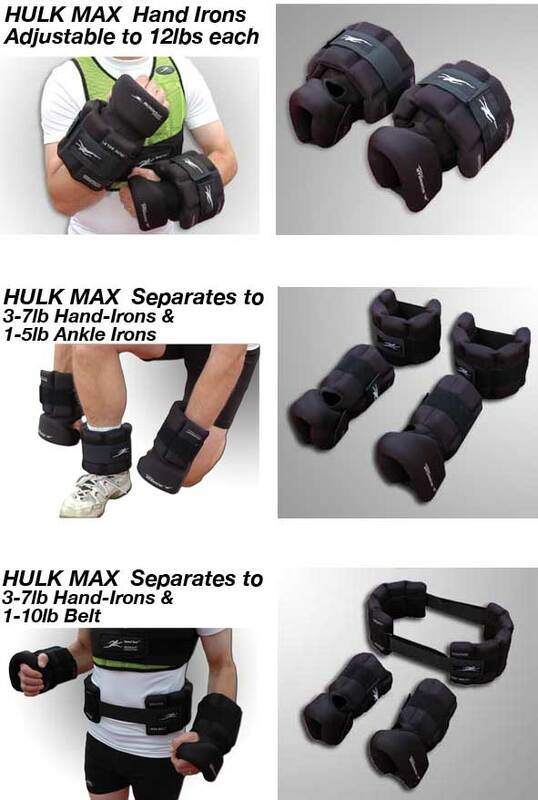 Moreover, the “Hulk Max 24 Club” is designed such that each hand can be easily adjusted up to 12 pounds or disassembled so that each hand has 7 pounds and the remaining 10 pounds can be used as a weight belt or two 5 pound ankle weights. I purchased the “Hulk Max 24 Club” system and could not be more pleased. The product was exactly as described and is one of the best purchases I have ever made. The first time I used the weights I wore them as two 7 pound hand weights and the 10 pound waist belt. I started jogging around the 3.5 mile park trail and both the hand weights and waist belt were comfortable and snug without moving or chaffing. My hands were still free to use my mp3 player or adjust my backpack. A little less than halfway around the trail I could no longer keep my arms up and realized I would have to work my way up to 7 pounds on each hand. I stopped and quickly removed four of the ½ pound weight inserts from each hand to bring them down to 5 pounds each. At the end of my half hour jog I was totally spent. My arms and legs both felt like I had been hitting the gym hard and it was a few days before they had recovered to the point where I could go again. After a few short weeks I noticed my arms and legs were much more solid and defined than they had been. I was then able to increase the hand weights back up to 7 pounds each, only having to relax them a couple of times during my run. I would try to go for a run about three or four times a week and in a couple of months I was in the best shape of my life. I also started using the weights like more traditional dumbbells. The range of motion and ability to have the hands free makes the “Hulk Max 24” system ideal for all kinds exercise routines from tricep extensions to chest flyes and even leg-raises for the abs by transforming the waist belt into ankle weights. Jogging with these weights provides a workout that is the perfect combination of cardiovascular and strength training. With only 3-4 half-hour workouts a week I have now not only managed to gain back the size in my arms I had lost but my legs are ripped and I have dramatically improved my cardiovascular fitness. One of the best aspects of this type of training is that it balanced muscle building because you work using your body’s natural movements. Hiking, even with a heavy oversized pack, is a breeze and rock-climbing is easier than ever. Now when I go distance running and leave the weights behind it is almost like I am not running at all. In fact, I am now at the point where I want to start adding more weight to my hands but do not want to get rid of the 10 pound weight belt- I just want more weight- so I plan on purchasing the “Club Iron Belt” for an upgrade. 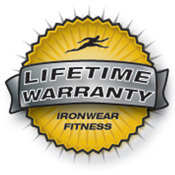 This time, there was no question what company I would purchase from- Ironwear Fitness really does produce the “World’s Best Fitness Products” as they claim. It is no wonder that police, firefighters, and sports teams buy these products for training, the quality and results really are amazing. My Ironwear Fitness gear is still in excellent condition with only slight wear, purely cosmetic, around the thumb holes. I look forward to many more years using this equipment and will continue to turn to Ironwear Fitness to increase my weight set and improve my fitness. Thank you Ironwear Fitness for creating such amazing products. HULK MAX 24 System™ (Adjustable Hand Irons / Belt / Ankle Weights™) Champion Series 3 to 12 pound per hand weights (6 to 24 lb. per pair), 1-10 lb. belt, 1-5 lb. ankle weight system. HULK MAX™ System™ is IRONWEAR ™’s most advanced and challenging heavy weight system. The patented HULK MAX™ System combines all the best features of Hand Irons™, Wrist Irons™, and Iron Belt™. HULK MAX™ System lets you quickly position the weight in different locations to work or rest different muscle groups. For example you can start off with all 24 lbs. on the arms and then quickly switch to 14 pounds on the arms and 10 pounds on the ankles. Then you can switch the 10 pounds to your waist to give your arms and legs a break, all the while you are still benefiting from carrying the additional weight. HULK MAX™ System is complete and includes enough weight for the most advanced pro athlete, but can be loaded to match your level of fitness. Start up low and as you advance you can keep adding the weights. Another great thing about the system is that you can use the Iron Belt™ to hold extra weights so that you can add or remove the weights from the Hand-Wrist Irons™ while you are out training or just walking. HULK MAX™ System comes with 36 – ½ lb. Flex-metal™ inserts and two 3 pound sections of IRONWEAR ™’s Flex-metal™ sculpted to the curves of the right and left hand. Together the system totals 24 pounds, that is more than most heavy weighted vests. HULK MAX™ System includes IRONWEAR ™’s unique patented Adjustable Hand-Wrist Irons™ that have 4 pockets in each hand, each pocket can hold 2 half pound weights. With all 8 weights installed each hand, the weight is 7 pounds. With the second 5lb layer laced into on to the first the total weight can be taken to 12 pounds per hand. HULK MAX™ System includes IRONWEAR ™’s unique patented Iron Belt™ which has 10 pockets that will accept two ½ lb weights per pocket for a maximum of 10 lbs. The system can also be separated into two 5 lb ankle, wrist or thigh weights. HULK MAX™ System was created for developing and experienced athletes who want to be challenged. The system offers a wide range of options for basic or intense training for all types of sports, as well as body building, boxing, karate, and kickboxing. HULK MAX™ System, Champion Series weights are covered with an abrasion resistant padded black nylon laminate for maximum durability and sweat absorbsion.